Our latest network expansion is neighboring French-Guyana located at the east of Suriname. 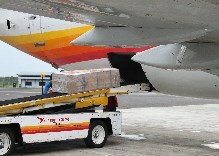 Two times a week we offer a cargo service on our passenger flights to and from it's capital Cayenne. Our Interline Agreement with Qatar Airways benefits us to take your cargo to and from various exotic destinations such as Asia, the Middle East, the Americas and beyond. Copyright ® 2019 Surinam Airways Cargo. All rights reserved.